Believe it or not, these are significant nutrients for plants. Plants need carbon and can absorb it in the form of Carbon Dioxide to produce sugar. When the plant later burns / eats the sugar it needs oxygen for the aerobic (with oxygen) breakdown of sugar. Breaking down sugar provides a lot more energy than breaking down sugar without oxygen. All known life needs water, but plants need it for different reasons than people. Plants need water to conduct photosynthesis. Plants split water in half then later form a water molecule through one cycle of photosynthesis. I guess there is a lot of energy in light. Plants also need water to maintain their shape. Animal cells don’t have cell walls. Plant cells have membranes, like animals do plus a cell wall. The cell wall keeps the plant standing up. This is why plants don’t need bones, yet we find bones in animals. To keep plants upright water fills plant cells. The cell wall then contains the water inside. A plant cell is slightly pressurized. When plants don’t have enough water, they wilt. The plant cells are depressurizing and losing structure. Seen in the plant falling in height and bending to gravity’s will. Most plants are autotrophs, meaning they make their own energy. They do this by capturing radiation from the sun and turning it into chemical energy. We use light to see but often can’t tell how much light is in the environment only if it is sunny or shady. Plants know precisely how much light they are being exposed to. One easy mistake humans make is to put a plant in the wrong light condition. We think that a spot can be sunnier than it actually is, or we put a plant that prefers the shade in direct sunlight. Make sure to put your plant in the type of sunlight it naturally prefers and that it is getting enough light. Depending on the type of plant, the amount of support plants need will change. Plants use soil, structures in the environment, or other plants to stay upright. Statocytes are amyloplast – heavy, sacks of sugar in the cells of plants. The sugar falls to the bottom of the cell and plants know which way is up, this is called gravitropism. Plants then use this information to grow roots downward and leaves upward. Plants want to grow up to get as much sunlight as they can. Roots and strong stems can make sure plants stay up. This approach needs soil. In hydroponic systems, rocks are used as an artificial soil, so plants have something to hold onto. Some plants use a different strategy: tendrils. Some plants like peas, cucumbers, and squash have modified leaves that wrap around nearby objects. This allows them to climb and get taller than their stem can support. Plants need to be upright or the will lose out on sunlight, or be attacked by a pathogen. Plants need additional nutrients beyond oxygen, carbon, and water. They need machinery to turn sunlight into sugar. That machinery is proteins, pigments, membranes, and energy storage molecules. On top of this plants need to coordinate their efforts in the cell and pass on information onto the next generation, DNA. All these things need nutrients. The big ones are Nitrogen, Phosphorus, and Potassium. Nitrogen is found in every protein. It is part of amino acids, the building blocks for proteins. Phosphorus is needed for energy storage and to make membranes. Membranes are found in every alive cell in the plant. Potassium is needed for signaling and protein formation. These are just the three major nutrients required. For a full list, see Solutions for Plant Nutrient Deficiencies. Since these nutrients create proteins and machinery for photosynthesis, signs of nutrient deficiencies often first appear in the leaves. Plants often don’t have enough nutrients because other plants have already absorbed the nutrients in the soil. Nutrients might have not been in the soil in the first place. Properties of the soil could be preventing the plant from up-taking the nutrients. Nutrient deficiency is a common problem. Plants sometimes lack pieces they need to stay healthy. That is where we can help. A plant wilting from not having enough water? We water it. A plant bending from the weight of fruit? We stake it. Plant lacking nutrients in the environment? We fertilize it. Fixing all of these issues is recommended to keep your plant healthy. Likewise, make sure your plant has enough nutrients. Growing healthy plants is easy when giving them the right mix of what they need. Does your plant have air? They need access to oxygen and carbon dioxide to make and eat sugar. Does your plant have water? They need water for photosynthesis and to keep their shape. Does your plant have the right light? They need it to make energy. Does your plant have soil and/or a support system? They need it to capture light and stay safe. Does your plant have nutrients? They need it to conduct photosynthesis, and to carry out normal functions. Make sure your plant has all these things, and you might be growing a very happy plant. 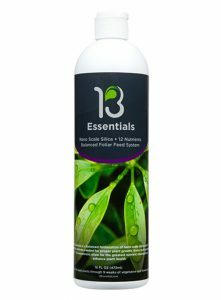 13Essentials is a balanced formulation of nano-scale silica plus 12 other nutrients to maximize results of plants. Compatible with all fertilizer programs, 13Essentials is a highly concentrated formula that gives plants everything needed to remain healthy throughout the growth cycle.